There is some benefit to alternating the mowing pattern each time you mow the grass. Mowing the same direction every time tends to compact the soil where you walk behind the mower repeatedly and can eventually cause wear patterns. Alternating the pattern is easy. One routine might be to cut in an east/west direction this week, then use a north/south direction the next time and mow diagonally the next. This strategy produces an attractive pattern in the turf and achieves a more even shearing of the turf over time. With side discharge mowers, alternating mowing direction disperses clippings over the lawn more evenly for more uniform fertilization. The groundspeed of a mulching mower makes a considerable difference in its ability to reduce the size of the clippings it discharges. Under normal conditions with dry grass that is not too tall, mulching mowers work just fine at a comfortable walking pace. If the grass is longer than normal or if it is a bit wet from dew, then slow the pace down some to let the mower handle this additional load more easily. On a riding mower just lowering the speed by one gear level makes a big difference in the effectiveness of the mulching process. When mowing on sloping ground, mow across the face of the slope, not up and down. Use extra caution when changing directions while mowing on slopes. If possible, avoid mowing excessively steep slopes at all by planting groundcover plants. Few homeowners realize how harmful a little nick from a lawnmower in its bark is to a young tree, particularly during the late spring and early fall. Even the smallest wound in the thin, tender bark can cause its premature death years later. Wounds and abrasions allow disease and insects to gain access to the inner wood. They gradually weaken the tree, making it vulnerable to other insects and diseases. Avoid touching your trees with your lawn mower or other yard care equipment. To assure that you keep your distance spread a two foot wide layer of organic mulch or groundcover planting in a circle on the soil around the tree trunk. This also reduces the amount of lawn to mow and helps to nourish the tree. Plastic trunk guards available in garden centers and hardware stores offer some protection to younger trees. Most of the time the lawn mower will not be able to cut all areas of the lawn, like along the sidewalk or driveway, or along a stone lined garden bed. There any number of tools used for trimming the lawn edges and making it look neater. You can go to the Yardener's Tool Shed and for hand trimmers (called grass shears) click here and for powered trimmers click here. While it is obviously extra work, trimming and edging the lawn after mowing gives it a much more finished look. Always wear heavy shoes, protective eye wear and (if gasoline driven) ear protection when operating any power trimmer or edger. Trimming--Mowers usually leave some tall grass in the corners of the lawn, and along walls, fences or garden beds. This is often where weeds get their first foothold. Cut them back with hand grass shears or clippers. If you want something larger and faster, try a power string trimmer which cuts down weeds and grass with a whirling nylon string. The electric versions are light, easy to use and ideal for residential scale trimming jobs. Never let the string actually strike tree or shrub stems, to prevent life threatening wounds. It's best to trim these areas with a hand tool. 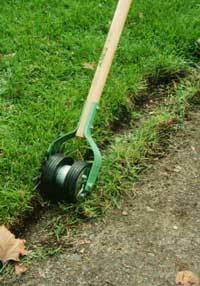 Edging--Edgers give a manicured look to your lawn by creating carefully cut turf edges around sidewalks, driveways, and patios. While hand edgers do the job, they are high maintenance, requiring a fair amount of time and energy. Power edgers are much easier to use and do a cleaner, faster job. Wait to mow a brand new lawn started on bare soil until the grass is three, or four, inches tall. For the first mowing, set the mower at 2½ or 3 inches high to take just enough off to give it an even look. Then a few days later, lower the mower to 2 inches and mow again. Setting the mower on the high side minimizes the tendency of the vacuum in the rotary mower to pull the tender new grass seedlings right out of the ground. A pair of scissors will do the trick on small patches of new grass. New grass that is overseeded into an existing turf is in less danger of being inadvertently dislodged by a rotary mower. Mow the newly sprouted lawn when it is time to mow the surrounding established grass at about 3 inches.